Having been raised by wolves, I was naturally quite interested to find the photo at right wandering around the internet. What was this curious little beastie? Photoshop was the word that sprang immediately to mind, but the reality is that this poor critter is (likely) real, and exhibits a spinal deformity common enough to have a name: baboon dog syndrome. The name appears to have originated in South Africa, where enough animals were found exhibiting this condition that the locals had a name for it. It’s not endemic to wolves, of course: according to the references below, the South Africans saw the issue in dogs, and apparently it’s also been seen in foxes and other wild canids. 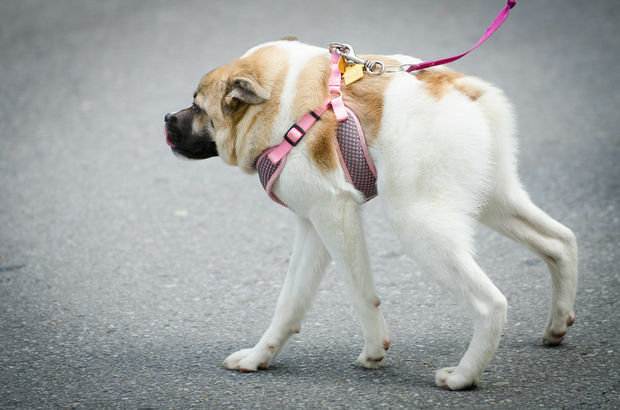 Baboon dog syndrome is differentiated from achondroplasia/dwarfism in that the latter (usually/often) produces animals with shortened limbs and a normal-length spine (resembling a Corgi) while baboon dog syndrome produces animals with what appear to be normal limbs under a half-length or apparently “missing” spine, and often a “bob” tail. This forum thread contains references to Genetics for Dog Breeders, by Frederick Bruce Hutt, which notes an inherited abnormality in dogs which results in an extreme shortening of the entire spinal structure; an illustration of an image by David Klocker Ehrenstrahl of a “fox-dog cross” (unlikely due to differences in chromosomal number) with the condition (Google does not reveal this painting); and a reference to How to Breed Dogs, by Leon Whitney, which supposedly contains a photo of the skeleton of a baboon dog. This thread references a book called Animal Genetics, also by Frederick Bruce Hutt. Google Books indicates this book mentions “the baboon dogs of de Boom”, described by Dr. H P A de Boom of the Veterinary Laboratory at Ondestepoort in South Africa, and contains photos of such dogs, showing the “typical humped back, short tail, and apparent lack of any neck”. The dogs are also mentioned in Comparative aspects of reproductive failure, a paper presented at a conference at Dartmouth Medical School in 1966. This imgur thread has some photos of modern-day dogs with the disorder, including this one, as well as a fox and the above wolf photo. This reddit thread contains photos of a dog named Pig who appears to have the syndrome. A link sends you to the Do Day Day Dog Festival in Birmingham, Alabama, where Pig appeared with her owner Kim Dillenbeck. A news article on Pig, with video, and some more details about her, is available here. Pig is visible in the animated GIF above right. This thread contains photos of a horse with the same condition. This page has a passing reference to a similar-appearing condition being caused, in mice, by an overabundance of vitamin A during gestation, which affects expression of the HOX gene. 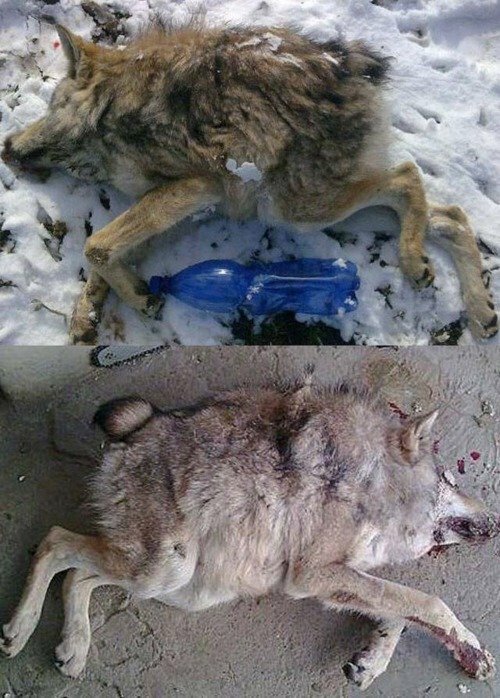 The original “deformed wolf” photo, captioned as being “taken down by hunters in Russia”. A fox with what appears to be baboon dog syndrome. A dog with what appears to be baboon dog syndrome. A horse with a condition apparently similar to baboon dog syndrome. “Cuda”, the pit bull, who appears to have baboon dog syndrome. Pig, a dog who appears to have baboon dog syndrome. A yellow Lab who appears to have baboon dog syndrome. A dog purportedly with baboon dog syndrome. A miniature horse with what appears to be a condition similar to baboon dog syndrome. This is just another instance wherein an animal which comes to community attention as an individual (rather than as an anonymous member of a group) suddenly joins the Monkeysphere and becomes worthy of a social bond. 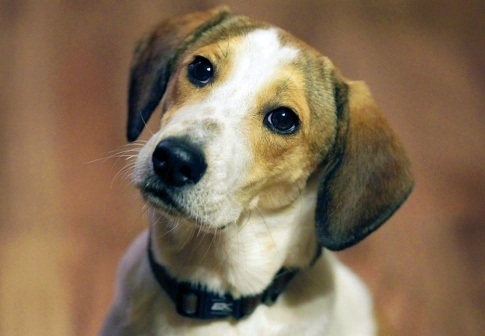 Nobody wanted to adopt an anonymous beagle when he was one of hundreds of unwanted dogs and cats at a shelter in Alabama. “Hundreds of unwanted dogs and cats” is a huge, vague concept, and it’s hard to form a social bond with, or feel one is personally able to help, “hundreds of unwanted dogs and cats”. However, once he was brought to national consciousness as an individual dog with a name, people fought over the right to adopt him and a home was almost immediately found. This is, by the way, why savvy shelters post individual web pages for each animal, with a little story about each, and a name for everybody. It’s hard to open your heart to “181406M”, but it’s easy to find a soft spot for “Daniel”.